When Nathan Stall, Yoan Kagoma and Jen Bondy started their medical training four years ago they did so with the aim of making an impact on their patients and the world once they graduated. They didn't imagine at the time that even before their final lecture, they would have left a lasting legacy on the School, the environment and on global health. Stall, Kagoma and Bondy are graduating along with 145 of their classmates at convocation this Friday May 18th at 9:30 a.m. and are the co-founders of Operation Green. Operation Green collects open, but unused surgical supplies from local hospitals such as gloves and suture packs, and ships them to International HOPE, a humanitarian medical resource organization assisting developing countries. The student-led program is the first of its kind in Canada. "I'm tremendously proud," says Nathan Stall. "We started in one operating room in University Hospital with one surgeon, and now we've grown to four cities." And the students credit much of what they were able to achieve to the support they received during their medical training here at Schulich Medicine & Dentistry. The idea behind the program came from a provocative first year lecture about the waste generated by health care. The lecture was given by Dr. John Howard, a professor in the Department of Paediatrics and Medicine who is now the chair of Canadian Association of Physicians for the Environment and the former chair of EcoHealth. Once the idea was born, the students received huge support from other faculty to turn the idea into reality. Dr. Douglas Naudie allowed the students into his operating room to study the amount of waste generated through surgery. "He supported us tremendously. He allowed us to pilot Operation Green in his operating room before expanding elsewhere," says Stall. 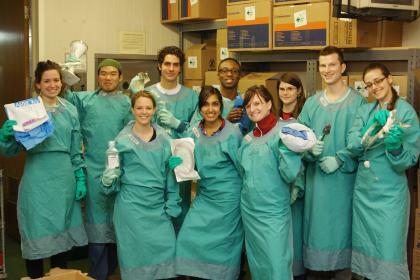 The three students found that one surgery produced the equivalent of 2,000 garbage trucks of waste per year in Canada. In any surgical procedure, many of the utensils prepared for the surgeon remain unused at procedure's end. Collecting these items, which would otherwise be wasted, members of the Schulich School of Medicine & Dentistry group package and ship them to developing countries in desperate need of such items. In just the first two shipments in 2011, 1,300 pounds of material worth an estimated $26,875 was sent to International HOPE. The hospitals locally benefit with reduced waste pickup costs. The students have now written a manual for other medical students on how to start their own Operation Green programs. "We're seeing real change, with physicians and other health care professionals taking an interest, wanting to know how they can contribute, and being cognizant of how medicine, and the way we practice medicine, affects the environment on a day-to-day basis," says Stall.